Catherine Noele Worlee (1762-1835), the future Princesse de Talleyrand- Perigord, was born in India in the Danish possession of Tranquebar. Her father was a French official stationed at Pondichery. In 1777 her family moved to Chandernagore where she met an Englishmen of Huguenot extraction, George Francis Grand, a burly functionary of the British Civil Service. They were wed the next year in Calcutta when Catherine was barely sixteen. Earlv in her married life, the beautiful young woman was involved in an affair with Sir Philip Francis. Grand sued Francis for alienation of affection and won a judgment of 50,000 rupees. Grand then took his wife back to Chandernagore, but several months later Francis put her on board a ship bound for England. 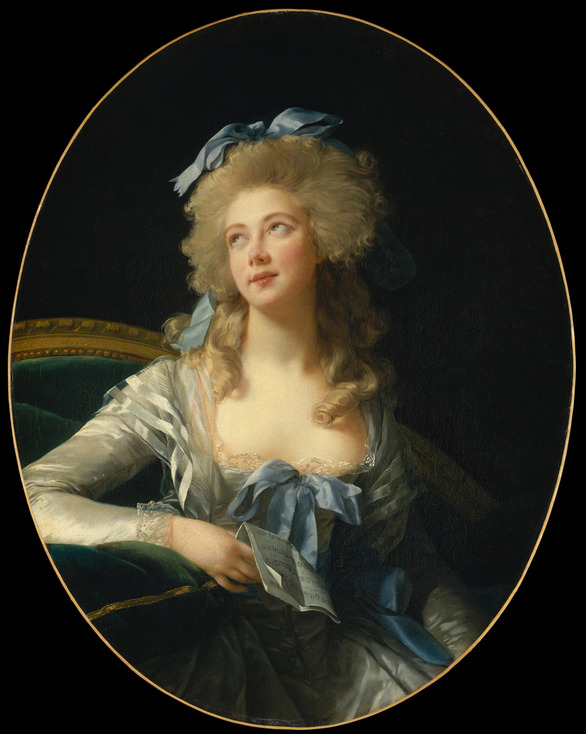 By 1783, the vear this portrait was painted, Mme Grand had become a notorious courtesan and was living in Paris on the rue du Sentier, very near Mme Le Brun's townhouse, the Hotel de Lubert. Mme Grand's lover at the time was the banker Valdec de Lessart. In 1792, having barely escaped massacre in the streets of Paris, she fled to England. After the fall of Robespierre, although her name still figured on the list of emigres, she returned to France on the arm of her Genoese lover, M. Spinola. The two were arrested, he was deported, and Mme Grand remained under close police scrutiny. During the Directorat, she was imprisoned on charges of espionage. The Minister of Foreign Affairs, Charles Maurice de Talleyrand (1754-1838), came to her assistance and wrote to a member of the Directoire, Barras: "She is Indian, very beautiful, very lazy, the most idle woman I have ever known. I ask for your interest on her behalf." Mme Grand and Talleyrand lived together openly at the Minister's official residence until the Concordat was signed in 1802. Bonaparte then ordered Talleyrand to marry her or give her up, because she could not continue to represent the government in her status of mistress. A divorce was obtained, and Grand, who had reappeared, received a handsome stipend and was packed off on a permanent mission to the Cape of Good Hope . On September 9, 1802, the nuptials were celebrated in the presence of the First Consul and Mme Bonaparte. By forcing the aristocratic Talleyrand, a former Bishop of the Roman Catholic Church, to marry a divorced woman, a suspected spy, and a courtesan, Bonaparte thought he was insuring the loyalty of his opportunistic Minister. Talleyrand's-passion had cooled considerably, and the little affection remaining between him and his former mistress was destroyed by the fact of the marriage. Mme de Talleyrand allowed herself to grow exceedingly stout. When the Empire fell, in part because of Talleyrand's scheming, she was still performing her duties as wife of the Minister. This state of affairs lasted until her husband went off to the Congress of Vienna with his beautiful niece in tow. Outraged, she left Paris for London, then went to Brussels before settling to the north of Paris at Pont-de-Sains. With the passage of time, she became devoutly religious and a fanatic royalist. Talleyrand later gave her enough money to live luxuriously in London. She returned to Paris and died there on the rue de Lille, with the Archbishop of Paris administering the last rites. Talleyrand breathed a sigh of relief. This "belle indolente," although not stupid - she was after all shrewd enough to ensnare the brilliant Talleyrand - was renowned for her child-like beauty and the ingenuousness of her public utterances. When asked where she was from, she would respond naively, "je suis d'Inde" (I am from India), but the phrase could be, and was often, construed as "je suis dinde" (I am a turkey). [Talleyrandl was then married to Mme Grant [sic], a very pretty woman whose portrait I had painted before the Revolution. A rather funny story is told about her. M. de Talleyrand, who was giving a dinner for M. [Vivant] Denon, who had just accompanied Bonaparte to Egypt, urged his wife to read several pages of the history of the famous traveler to whom he wished her to address a kind word, and he added that she would find the volume on his desk. Mme Talleyrand obeys, but she takes the wrong book and reads a rather lengthy portion of the adventures of Robinson Crusoe. At the table she assumes the most gracious air and savs to Denon: "Ah! monsieur, with what pleasure I have just read about your trip! How interesting it is, especially when you meet poor Fridav!" God knows how M. Denon reacted to these words, and especially M. de Talleyrand. This little anecdote spread throughout Europe. Perhaps it is not true. But what is incontestably so is that Mme de Talleyrand had very little wit, but then again her husband had sufficient for two (Souvenirs, 1, 249-250). In her catalogue, Vigee Le Brun lists two portraits of Mme "Grant" [sic], the first in 1776 ("I Madame Grant, depuis princesse de Talleyrand") and the other in 1783 ("I Madame Grant"). As Catherine Worlee was only fourteen in 1776 and still living in India, the first indication is obviously incorrect. 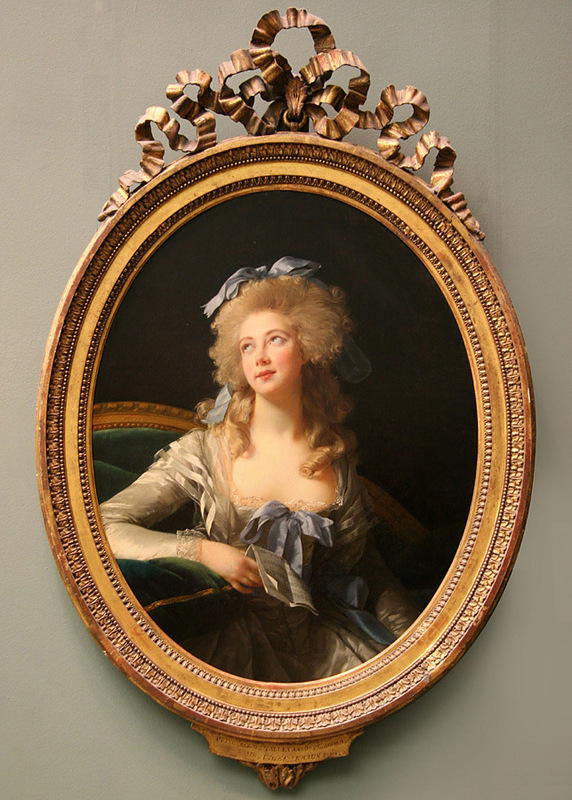 When it was exhibited at the Salon of 1783, the Mercure de France judged the present portrait to be a very good likeness. Mme Le Brun highlighted the sitter's profusion of blond curls falling around her neck and onto her bosom. The langourous pose and upturned eyes of this modem-day Saint Cecilia harken back to Italian Baroque religious painting (notably to Guido Reni, Domenichino, and Carlo Dolci), perhaps via Greuze, who often had recourse to such posturing. The portrait belongs to the eighteenth-century genre, the "tete d'expression" (see cat. no. 55). Vigee Le Brun was especially drawn to this type of posing, which she later popularized in her salon in sophisticated parlor games known as "attitudes" or "tableaux vivants." A variant of this portrait (whereabouts unknown, illus. in Helm, , facing p. 92), which has always been attributed to Vigee Le Brun, shows the sitter with short hair and wearing an empire gown. The majority of the known copies are listed in the exhibition catalogue French Painting 1774-1830, cited below. Others are in the collection of M. and Mme Gaston Palewski, Chateau du Marais, and at Berry College, Rome, Georgia. PROVENANCE: Jacques Doucet collection; his sale, Paris, Galerie Georges Petit, June 6, 1912, lot 190; bought by Knoedler, New York; sold to Mrs. William Bateman Leeds, later Princesse Christophe de Grece, Paris, 1914-1923; family of the latter, until 1934; Knoedler, New York, until 1935; Mr. and Mrs. E. Harkness, New York, 1935-19401- donated by them in 1940 to The Metropolitan Museum of Art; effectively entered museum in 1950. MAJOR EXHIBITIONS: Paris, Salon, 1783, no 117; New York, World's Fair, 1939, no. 127, illus. in commemorative album; Paris, Grand Palais, De David a Delacroix, November 15, 1974-February 3, 1975, no. 196, illus. (exhibition traveled in 1975 to Detroit Institute of Arts and New York, The Metropolitan Museum of Art, under the title French Painting 1774-1830; the entry of the American translation of the catalogue is more complete). SELECTED REFERENCES: Salon criticism, 1783, anthologized in Collection Deloynes (Paris, Bibliotheque Nationale, Cabinet des Estampes), XIII: No. 303 - L'Impartialite au Sallon, p. 28; No. 309 - Mercure de France, p. 916. Other Salon criticism, L'Ann6e litteraire, 1783, p. 262. Souvenirs, 1, 249, 331; Nolhac, 1908, pp. 30, 151, illus. in color facing p. 36; Helm, [19151, p. 222; Hautecoeur, [19171, pp. 32, 40; Blum, 1919, p. 157, illus. facing p. 80; C. Sterling, Catalogue of French Paintings in The Metropolitan Museum, New York, 1955, pp. 185-188, illus. (entry provides detailed bibliography and provenance history).